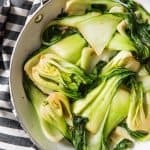 Stir-Fried Baby Bok Choy is a simple vegetable side dish that is ready in under 10 minutes start to finish. It's a little garlicky with a great tender-crisp texture and one of my go-to veggie options when I'm making a more protein-centric main dish and want a great vegetable to serve. Trim the bottoms of the baby bok choy and rinse thoroughly in cold water to remove any grit that likes to collect down at the base of each bundle. Cut any larger pieces in halves or quarters, if needed. You can leave very small and tender baby bok choy whole, just make sure all of the bok choy is roughly the same size so they cook evenly. Heat a large pan over medium-high heat, then add the oil and swirl to coat the bottom and sides. Add the garlic and stir-fry until fragrant, about 30 seconds, but be sure not to burn. Add the bok choy and stir-fry for 2-4 minutes, until the green leaves are wilted and the stalks are tender-crisp. I find it easiest to use tongs and when working with baby bok choy so I can grab some of the leaves and turn them over or toss them around the pan. Add the soy sauce and season with freshly ground black pepper, then cook for another 30 seconds. Transfer to a serving plate and serve hot. You can make this side Whole30 compliant by subbing coconut aminos for the soy sauce, or just using salt to season the bok choy instead.